The commune of Zau de Câmpie lies in the heart of the Transylvanian Plateau, approximately 60 kilometers east of Cluj-Napoca. 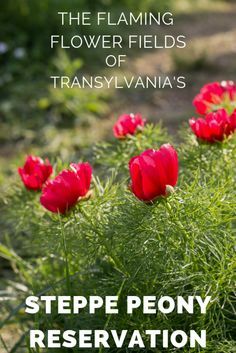 The area is known as the open country of Transylvania, home to vast fields of agricultural lands dotted by fishing ponds and sparsely-inhabited villages. At first glance, it’s your typical back country landscape with nothing special to it. But in reality, for merely 10 days each Spring, it is home to one of the most stunning and unique flower “shows” in all of Romania. Nestled between the hills situated at the periphery of the village, there’s a small natural reserve protecting the stunning Paeonia tenuifolia flower species, known as the “steppe peony”, also called the fine-leaved peony or narrow peony in other lands. The reservation was set up way back in 1932 (!) by Alexandru Borza, one of the founding fathers of the Romanian school of botany. Ever since, it has been maintained, expanded and cared for by hard-working locals, who recognized the importance and the uniqueness of the reserve and fought hard to include it in the official heritage list of the Romanian Academy. The protected area can be reached via a quite bumpy, unpaved road, lining the massive agricultural fields of the area. You can park your car just outside the gated reservation. From the moment you step out of your car, make sure to watch your step! This area is home to over 300 protected plant species! Even though the main space where the peonies are located is fenced, there are numerous types of protected plants located outside the gate, so take special care even on the path. Plan your visit on a weekday. If you live close-by and have the possibility to go on a weekday, take advantage of this fact and plan your trip accordingly. The protected area is quite small and gets filled with hordes of people during the weekends, which is not exactly an enjoyable experience if you don’t like crowds. Be respectful! A lot of work and effort has been put in to maintaining the natural reserve over many years, so respect the Steppe Peony Reservation in its entirety and don’t under any circumstances, try to vandalize it. Don’t pick the flowers! I think this goes without saying, but I am going to put it out there anyways. Since these are protected plants, a unique rarity and there are a merely a few of them left in the area (according to some sources, this is the only place in Europe where the species still thrives), don’t pick them! They won’t even last until you get home, because they’re quite similar to poppies, since they lose their petals and wither quickly. Don’t get off the path! There are well-marked paths throughout, so do your best to keep on them and don’t step between the shrubs. If you do, there’s a high chance that you’ll damage them, so they might not flower properly in the following year. If you decide to take a walk on the hill towering above the Steppe Peony Reservation, you still need to watch your step. There aren’t any well-marked paths there, but you’ll still encounter dozens of steppe peonies scattered around, so take care! Take your litter with you! If I remember correctly, there are quite a few garbage cans by the reservation. But chances are, you come by car. This means that all you need to do is put your rubbish in the car and take it with you when you leave. The age-old saying is doubly valid here: “take only pictures, leave only footprints”. However, if you take a look at the Facebook page Rezervatia naturala – bujorul de stepa Zau de Campie, you’ll know exactly when they’ll be in full bloom, because they usually post updates there.